"This is a simple and flavorful recipe for an old standby. The sauce makes wonderful gravy to serve over the meat or mashed potatoes." Mix ground beef, eggs, bread crumbs, dry soup mix, salt, and pepper together in a large bowl; add about 1/2 the can of beef broth and continue mixing until beef mixture is thoroughly moistened. Divide mixture into six portions and shape into patties. Heat a Dutch oven over medium heat. Brown patties in the hot pot, 3 to 5 minutes per side. Spoon excess grease from the pot. Stir remaining beef broth with cream of mushroom soup and dry mustard in a bowl until smooth; pour over the browned patties. Bake in preheated oven until patties are no longer pink in the center, about 45 minutes. An instant-read thermometer inserted into the center should read at least 160 degrees F (70 degrees C). Great starting point and was very flavorful. 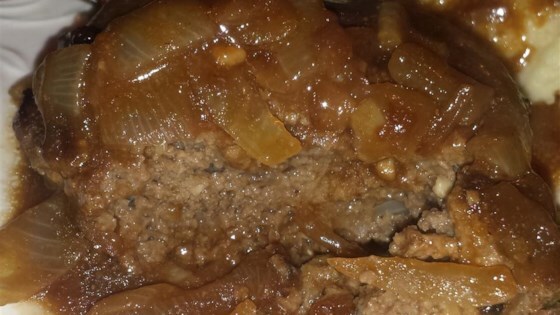 this is a very flavorful recipe.... although I did customize it a little because I substituted 1/2 ground beef with ground Elk meat... Everyone loved it.